Josephine “Jo” Schirra, married 62 years to one of the original Project Mercury astronauts, died April 27 at her Rancho Santa Fe home, according to a death notice. Josephine Schirra, wife of the late Mercury, Gemini and Apollo astronaut Navy Capt. 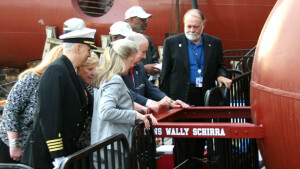 Wally Schirra, is assisted by friends and family members in launching the Military Sealift Command dry cargo/ammunition ship USNS Schirra into San Diego Bay in 2009. Navy photo. Wally Schirra was competitive even with his wife, Koppel said, and they vied in sports. Some of the younger Mercury 7 wives had “sour grapes” to relate because of all the divorces that ensued after the Apollo program, Jo noted but said she had a wonderful, exciting life, Koppel said. Capt. 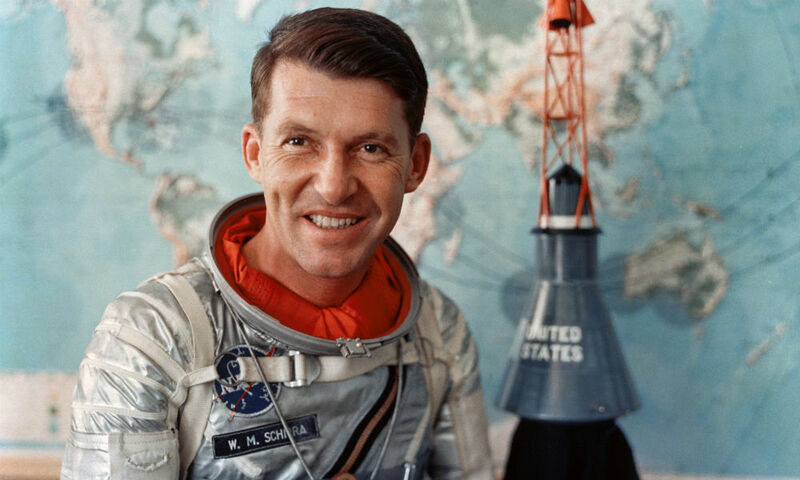 Walter M. “Wally” Schirra Jr., who died in 2007 at age 84 at a La Jolla hospital, was the fifth American in space, flying a six-orbit, nine-hour Mercury-Atlas 8 mission on Oct. 3, 1962. In the Gemini program, he made the first space rendezvous in December 1965. He commanded Apollo 7, an 11-day orbital test of the three-man Apollo command module in October 1968 — the first person to go into space three times. He was co-anchor with Walter Cronkite for the seven moon landings. Zoe Boyle was cast to portray Jo Schirra in the series, which premieres June 18. Only three Project Mercury wives are alive — Scott Carpenter’s former wife, Rene; John Glenn’s wife, Annie, and Gus Grissom’s widow, Betty. Glenn is the lone survivor of the original seven. Josephine was the daughter of Donald and Josephine Fraser, born and raised in Seattle. She spent a year in Coronado. The U-T reported in 2007 that the Schirras had lived in Solana Beach and Del Mar during Schirra’s two assignments as a test pilot at Miramar Naval Air Station in the 1950s. Jo was depicted as a sun worshiper with a great love of nature and all outdoor sports. In March 2009, Josephine helped launch the Military Sealift Command dry cargo/ammunition ship USNS Schirra into San Diego Bay. Jo Schirra is survived by her son, Walter M. Schirra III, of San Francisco, and daughter, Suzanne Schirrra of Vail, Colorado. In lieu of flowers, people were asked to make a donation to The Nature Conservancy, The National Parks Foundation or The Humane Society in her name.